Just something i thought i'd say. I suggested that if Dinho left we could incorporate him into the logo as he carried our team for a year and was a great help, plus he helped us buy Ibra and Robinho obviously with the CL position. I was told that it won't be changed until we win a trophy. Then it gets changed to a logo containing 4 players who are great, however we haven't won a trophy and Dinho is nowhere to be found despite his heroics? I appreciate the work, but it should contain more players, I suggest, Pirlo, Ambro, Rino, Pippo and Dinho atleast. Great work Riccardo, well done! If some of you wish to have more senators in it, we have Sandro there, though I agree that there are also other players who still mean much to Milan and have won many trophies with this club. But I think it's ok if we have these four players in the logo, they are very important for us atm and I'm sure they will win a trophy with Milan anytime soon. I seem to have annoyed a few of you. However, I aim to please, if someone wants to create a poll and I'll put the 4 most voted players up there. If anyone can be bothered doing that, then I'll oblige by changing the header. With regards to having our last triumph up there, the WCC 07, come on, it's depressing. I prefer to have a symbol of hope rather than indulge in glorious nostalgia. dont change anything, its perfect the way it is, when I look at those 4, I think of a club with great players, dont bring finished players into it . If we're going to live in the past, might as well make a banner with the Sacchi era players on it. Last edited by zZ[-_-]Zz; 26-05-2016 at 01:24. The banner is great the way it is.It would be to big if we include anybody else. Maybe when we win something on the other side of the emblem Ricardo can put another 4 Milan players like : Ambro,Rino,Pirlo & Pippo. Switch Silva with Pirlo/Gattuso and it would be perfect. Still very good though. Is Nesta balding or is it just the picture? No. The picture clearly is about this season, about the current Milan. Thiago Silva is along Zlatan Ibrahimovic our best player. It's a good choice of players. Zlatan and Silva are the best nowadays, Pato will be, and Nesta is the true leader of the team. Nesta, Silva, Pirlo and Ibrahomovic. Just an opinion though. I'd rather have Gattuso. More of a legend for Milan than Pirlo ever will be. I believe so too. Though I don't feel like Gattuso should be a part of this logo. Just a thought. I'm find lack of Ambrosini is weird. He's the captain. He's not on there because he's "old" ? Than why Nesta is there, he's even older than Ambro. Because his performances ? 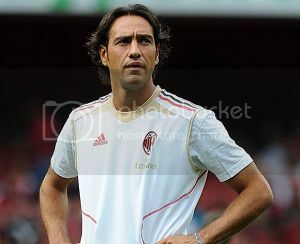 Many will agree Ambro is above nesta so far. Btw can just the banner take turn each other ? sometime "Banner A" show up, sometime later "banner B" show up, like that. Lot of forums/site do that. I'm not gonna start on a Nesta vs Ambro debate, but I like the idea of a banner A, Banner B, but I don't know if it's possible. If David says it can be done then I'll accommodate.